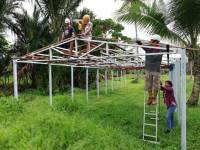 Our first project for 2018 was to make use of some of the recycled School frame and roof panels, kindly donated to us by the Philippine Red Cross. This multi-purpose building, with kitchen, toilet and shower room, will be used for meetings, small group training sessions and a temporary restaurant for our visitors. The building will be our Agriculture and Livelihood Training venue and form the core facility of our ATI Training Site accreditation. Our advocacy projects and farm development are financed by the commercial sale of farmed fish and other farm produce. By February, our Tilapia were ready fo harvest. In order to catch the fish, we reduced the water levels, mostly by draining or pumping water from the ponds. Our workers were then able to wade into the ponds and catch the fish by net, or by hand, where the water was low enough. We were then able to sell the fish in local markets or direct to friends and family. Being still live at the point of sale, the fish sold very well to customers looking for guaranteed fresh fish! 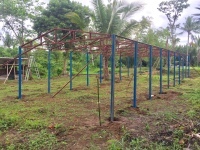 In March, we began our second big construction project, to build a greenhouse, to act as a base for our aquaponics projects and high value crops. 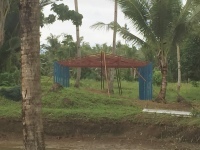 Built with the generously donated construction materials from the Red Cross and a private individual who helped fund the roofing materials. The greenhouse was entirely assembled by 4 people, by hand, with nothing more than a ladder, power drill and a socket wrench, the new building is 16.5m long, 5.5m wide and 3.5m tall. By April, our fish sales were completed and we were ready to start restocking the ponds. 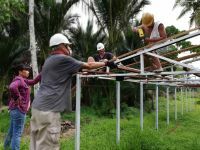 Unfortunately, due to the destruction caused by Tropical Storm Urduha just before Christmas, the BFAR facility that provides fingerlings, would not be able to give us supplies until June. We therefore took advantage for the wait, to impove the pond embankments, drainage culverts and clean, widen and deepen the ponds for greater capacity. 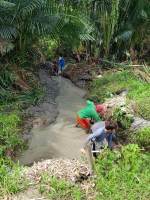 Our workers were also able to begin preparing our rice fields. We will be growing Red and Black rice varieties, which are healthier and lower in sugar than the traditional White rice. Our advocacy will be to encourage local farmers to follow suit and provide a guaranteed market, by buying their produce in bulk for distribution to large retailers, not normaly accessible to small farmers. In May we were able to start work on one of our primary advocacy projects, aquaponics. With increasing demands on available farmland, aquaponics is destined to be the future of sustainable farming. The process of using farmed fish waste to fertilize plants growing in a non-soil environment. However, standard aquaponics systems traditionally require expensive pipework, pumps, maintenance and runnings costs of many thousands or even millions of Pesos! Costs that are often well out of reach for the average Filipino farmer. ONEVisayas is seeking to develop low cost manual and gravity fed systems to take advantage of the time and muscle our farmers have in abundance. Our research will form part of our ATI Learning Site activities, passing our knowledge on and assisting with the setup and running of micro aquaponics farms. 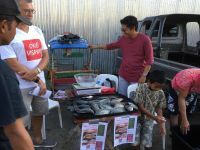 This advocacy also dovetails nicely with our desire to set up a Tilapia breeding facility, reducing our dependence on availale fingerling stocks from BFAR and allowing us to provide stocks to local farmers as part of their aquaponics farm setup. We have built a tank based breeding facility to research and develop a Tilapia breeding program. T he waste water from the tanks is used to feed plants in gravity drained or static systems. 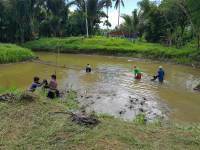 June saw us finally able to fully restock our Tilapia fish ponds, when supplies finally became available from the BFAR facility in Babatngon, Leyte. We hired a lorry and half a dozen workers to transport 40,000 Tilapia fingerlings back to our farm. As always, income from the eventual sale of the fish, will be used to fund our advocacy projects in aid of local subsistence farmers and for the further development of the research and learning facilities at our Integrated Technical Farm. Our status as an NGO working in the Farming and Agriculture sector, has allowed us to apply to the DENR (Department of Environment and Natural Resources) for a donation of tree seedlings, as part of their program to counter deforestation of trees in farmland areas. On July 18th, we were honoured to receive a donation of 200 seedlings. We were given 50 Narra seedlings, 50 Mahogany seedlings, 50 Talisay (or Talisai) seedlings a nd 50 Langka (or Jackfruit) seedlings. We spent several backbreaking days planting all the seedlings, but the effort will be well worth it, in a few years, when the mature trees will transform the appearance of the farm. Agriculture Training Institute, Baybay City, July 19th - ONEVisayas was invited to attend an event at the Visayas State University where we were to receive our certification as an official Learning Site for Agriculture (LSA) from the Agriculture Training Institute of the Philippine Department of Agriculture. 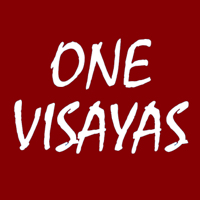 On August 12th, the ONEVisayas ITF hosted a meeting of the CHANCE Farmers and Livelihood Association, an organisation made up of farmers in Barangay Cabaohan, Pastrana. The association is set to receive a livelihood development package from the Yolanda relief fund in the form of farm equipment. 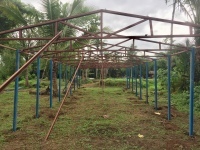 ONEVisayas Executive Director Frank Villablanca assisted the officers of the association as they sought arrangements for the management, storage, and shared use of the equipment amongst the farmer members. Following the meeting, the association was given a presentation by Mr. Allan Orais of Alboco Food Industry who shared with the farmers the economic benefits of planting organic local peanut varieties. Mr. Orais was keen to establish collaboration for the training of farmers on how to productively grow peanuts to address a growing demand in the Philippine peanut butter industry. In September, we bagan our latest construction project of this year. Our chicken breeding program has proved too successful for it's own good and we have been rapidly running out of space to house the chicks. We have therefore begun a project to build a new chicken house and compound, where they would have plenty of room to roam freely. Again, we are making use of the Red Cross donated construction materials to build a solid and permanent stucture to create a safe and secure environment.